I’ve found a redeeming quality to the repulsive-looking, destructive garden pests that live in the soil of my raised beds. Instead of seeing them as existing only to destroy my plants, I now realize that they can hold the attention of even the most distractible toddler. Even my younger boy has fantastic bug-hunting skills that can be put to use in our garden. I think they are some kind of beetle larvae, and I’ve been told they eat the roots of plants, so I don’t feel too badly that I let my boys make a corral for them and play with them till they expired in the sunlight (these grubs don’t last too long above ground). I saw a mockingbird having an absolute feast on them later after we’d gone back inside. My older boy had taken great delight in helping me pick them out of the newly-turned soil, and it definitely made it less of a chore for me as we were working together. 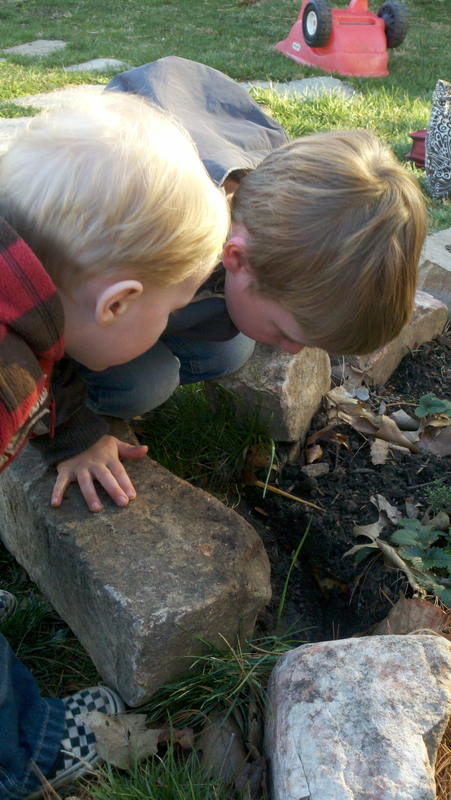 They love it — we find slugs, roly-polys, crickets, ants and the occasional big hairy spider. (One afternoon last month, they were supremely entertained when I went to pick up a cricket for them, but instead, when I opened up my hand for them to see, there was a large spider. I screamed and tossed it somewhere, then started thrashing about thinking I’d flung it up in my hair — ewww, shiver — I’m glad at least they thought it was funny). I do feel kind of badly about squishing the slugs in front of the boys, and they’re not quite old enough to understand WHY exactly they’re bad for the garden, so usually I toss the slugs out in the road while the guys aren’t looking and let the heat of the asphalt and/or passing cars do the job for me. 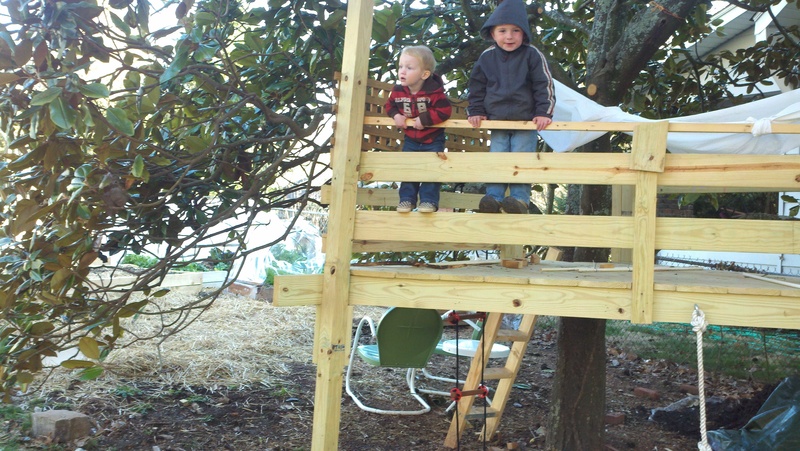 Another great addition to our garden this spring is the low treehouse my husband and brother built right next to the raised beds. It’s in an old magnolia tree, and it’s not too high up, so they can get up and down fairly easily without us worrying about them tumbling out. 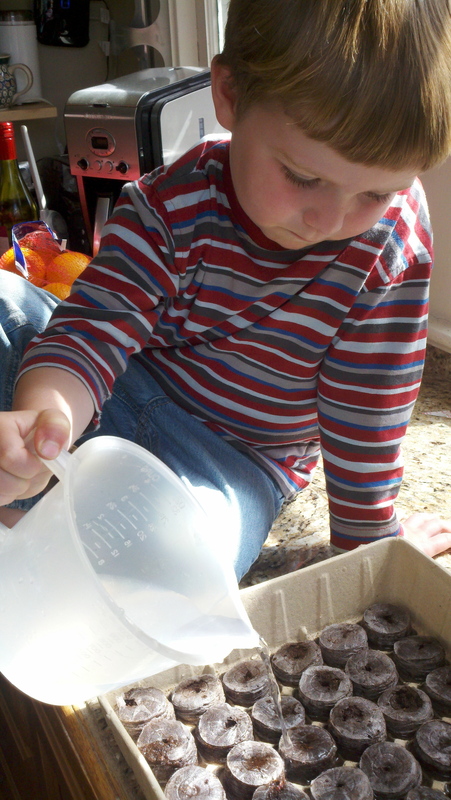 I also enlisted my older boy in planting some seeds indoors with me this afternoon. I tried using the little peat pellets, as they looked like something inviting for a 4-year old. Add water and watch them grow instantly! How perfect….sure enough, he loved watering them and watching me plant seeds (the tomato, pepper, and especially the epazote seeds were too small for his fingers to handle — the beet and radish seeds are more his size, and later in the season he’ll be able to plant bigger seeds like squash, beans, and sunflowers). You didn’t have any trouble with the beetle grubs biting your son? I had always thought them semi-harmless once out of the ground until I got a nasty bite from a big one while I was filling a garden bed. All the ones in my yard are the larval form of Japanese Beetles. They are the main reason why I’m trying to put up with the moles that burrow through my garden. Oh Yikes! Thanks for telling me — I’ll make sure the fellas wear gloves when we find more….and me too! 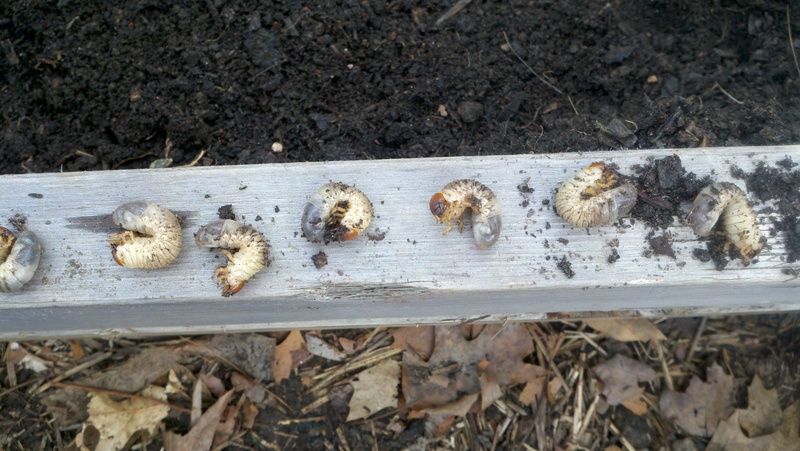 They sure are big grubs if they’re going to turn into Japanese Beetles….they’re about twice that size. Wonder if that’s what I’ve got…. From what I’ve read and been told, those look like the grub stage of Japanese beetles. We have a huge number of them in late-summer/fall. They also attract moles, which have been tunneling all through our yard in search of grubs lately. You might want to try milky spore, which appears to be an organic method of killing the grubs, and hence no more beetle or moles. I haven’t tried that method yet. Or, you could try getting a bunch of preying mantis egg cases and letting this natural predator hatch to take the beetles out — hopefully resulting in fewer grubs. I’m planning on going the mantis route this year. It’ll provide some entertainment/education for the kids, if nothing else. Thanks Rich — I hadn’t heard of milky spore, will give it a try. I think those grubs must also be killing some of our grass in the back yard — there are these weird round patches of dead grass all over. We tried to order some mantis egg sacs last year but there must have been a run on them because every place I looked was sold out! Maybe I need to start looking for them now (it was late last May when I started looking for them). 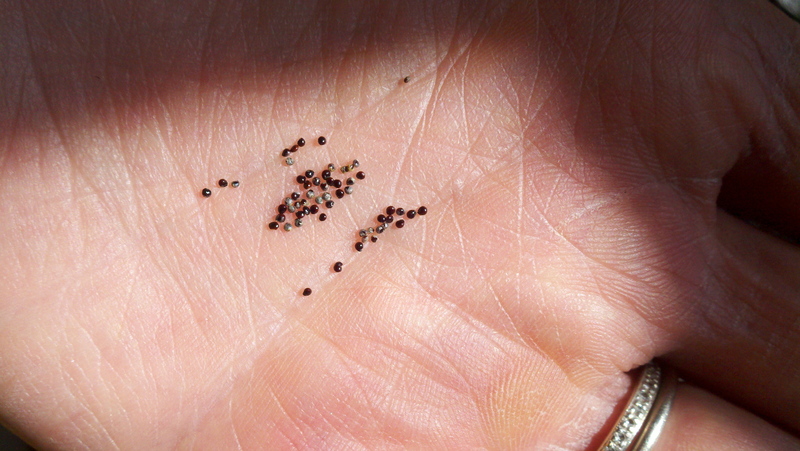 I have those here in Australia, plaguing my garden beds too..they are known here as Curl Grubs, and they eat plant roots :s (see Curl grubs here: http://www.annettemcfarlane.com/pestID.htm). I’ve found my magpie family and my chooks LOVE them (magpies are carnivorous birds, if you have a local equivalent, they may like a free feed). Like your little fella, I really enjoy digging them out, and putting them in an old icecream container so they don’t try to bury themselves again when I’m not looking! Thanks for inspiring me to get out to the garden today 🙂 (its 4C (39F) and has just rained). I hope you have a bountiful harvest this summer!